One of the key casus belli of the Second World War was Nazi Germany's problem with the Polish Corridor: the strip of land that separated East Prussia from the rest of the Fatherland. When the Germans invaded, therefore, one of their key objectives was to drive across the Corridor and link the two German armies deployed on either side. This would also isolate the Polish "Pomorze" army, stationed around Gdynia. This scenario, taken from my The September War, Part One scenario pack for I Ain't Been Shot, Mum! would represent one of the many encounters that took place between the Poles and the German 2nd Army and 19th Panzer Corps as part of this section of the campaign in an area known as the Tuchole Forest. The game would be a battle for territory: with three objectives on the 8' by 5' table and points scored (after the third appearance of the Turn Card) for possession: one point per objective per turn held. 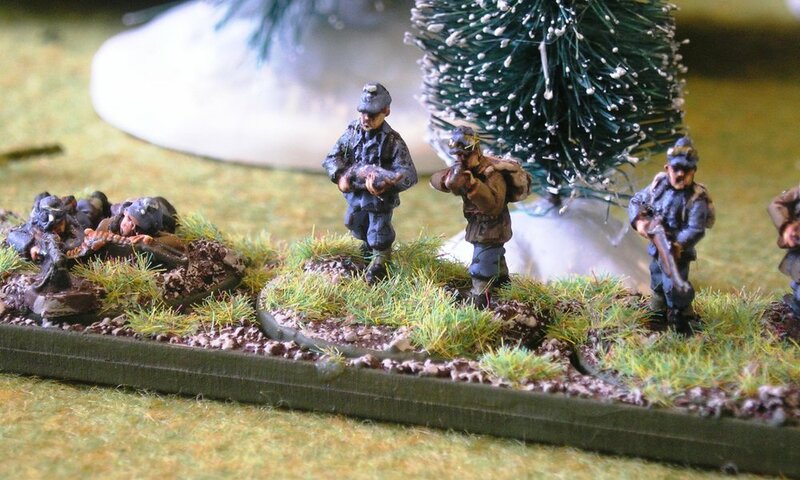 The Poles were on 'home ground' and would therefore start the game with a single infantry platoon on table and already in possession of an objective (the part-concealed objective in the picture above). The platoon was well dug-in, and was supported by two anti-tank guns and a taczanka (MMG on a purpose-built cart). At the other end of the table were two on-table 81mm mortars and another taczanka but, more importantly, another full infantry platoon and a half-strength KOP platoon (border guards) waited just off table and would arrive within the first few turns. The Poles also had more mortars off-table, controlled by an FOO attached to their main body. The Polish plan was to hold onto the objective they already possessed (the part-concealed objective in the picture above); ignore the objective in the middle of the table; but sprint their two reinforcement platoons forward as soon as they arrived to capture and then hold the final objective opposite where their mortars were emplaced. Their rationale was simple: hold the third objective - the one out in the open - for long enough to rack up enough points to win the game, even if it did mean taking lots of casualties. The Germans would start the game around one corner of the table. 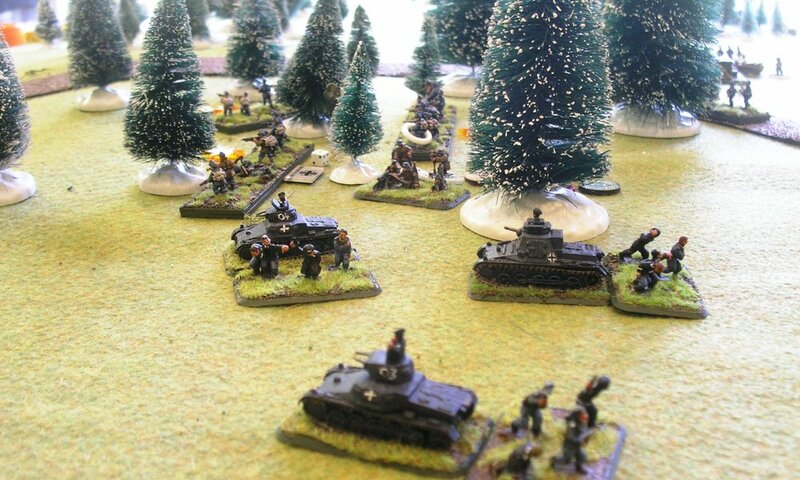 They began the game with two full platoons of infantry on table, supported by an MMG attached to each platoon, and a platoon of five Panzer I tanks. Waiting to come onto the table was another platoon of infantry, a platoon of three Panzer III tanks, and a heavy armoured car platoon of two SdKfz 231 and two SdKfz 232 armoured cars. The Germans would thus just about outnumber the Poles: although each side had about the same numbers of infantry and MMGs, in support the Germans had eight tanks and four armoured cars versus the Poles' three anti-tank guns and two anti-tank rifles. The Germans also had off-table artillery, and would benefit from air support from Junkers Ju-87 Stuka dive bombers. As the Germans had no idea where the Poles were, only where the objectives were, their plan was to start the game by advancing cautiously towards the first two objectives, with a platoon of infantry moving towards each, with the Panzer Is supporting the platoon aiming towards the objective in front of them on the other side of the table (the one already held by the Poles). Once the situation around those two objectives was resolved, all available troops, including any reinforcements, would head for and capture the third objective. The action began with the Germans, under John, steaming their way towards the two objectives nearest their start point. The objective in the centre of the table was easily taken, with a platoon of infantry effectively then sitting on it for the rest of the game. The objective opposite the German start point, however, was a very different matter. As German Blinds moved towards it, the Poles, under Dave, spotted another infantry platoon and the platoon of Panzer Is, and opened fire with everything they had. 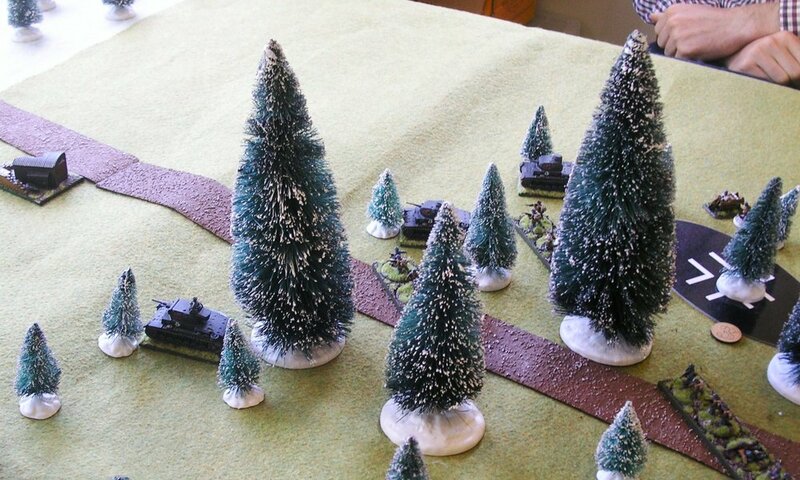 The German infantry platoon quickly ducked into nearby woods, and would spend the rest of the game under cover in the centre of said woods acting as a blocking force should the Poles try to move forward from their trenches. The only problem was that the Polish of-table mortars soon had their position ranged in, so the German infantry platoon also spent the rest of the game being Pinned and gradually whittled down! Meanwhile, the German light tanks pictured above, now without any infantry support, continued their assault on the Polish trenches in front of them...with predictable results. "We shall not, we shall not be moved!" The Poles had two anti-tank guns, a taczanka, and an anti-tank rifle that could punch holes in the Panzer Is, so before long, and despite some great armour saves, all five light tanks were all either destroyed or abandoned by their crews. With the first two objectives now firmly held, one by each side, the focus of the game changed to who could get to and possess, and start earning points from, the final objective first. Both sides had by now received reinforcements: with the Germans sending their three Panzer IIIs and their third infantry platoon across the length of the table towards the final objective. The Poles were technically closer, but it seems that their troops had heard about the plan to sacrifice their lives in exchange for game-winning points, and weren't at all keen on being used in that way. The Polish reinforcements stubbornly remained off table for a good few turns, and then moved really slowly towards the open ground around the objective and now firmly under German guns. For a moment it looked as if neither side was going to leave the safety of their works/the woods and go for the objective...but the Poles had a plan and stuck to it. With a final surge, their KOP platoon charged forward and "took" the objective, then prepared to hang on grimly and be shot down where they stood. After a brief interruption whilst John and Dave left and Bevan (Germans) and I (the Poles) took over, the Germans proceeded to hammer the Polish KOP infantry. The Poles, however, had managed to shift an anti-tank gun and a taczanka across the table from one set of trenches to the other, and whilst not giving as good as they got, were doing all they could to hammer the Germans right back again. The KOP infantry were eventually dispersed, but by this time the Poles had built up a three-point advantage. Now desperate, the Germans left the cover of the woods and tried to take the objective themselves. This they did, but then suffered the same fate as the KOP. Two of their three Panzer IIIs were destroyed, and their infantry battered, and the end of the game was approaching fast. Brief excitement then took place on the other side of the field again, as the final German reinforcements arrived: four heavy armoured cars that promptly moved towards the first Polish position. Equally promptly, however, the Poles now transferred an anti-tank gun back towards their original position, arriving just in time to blow the lead armoured car to pieces. 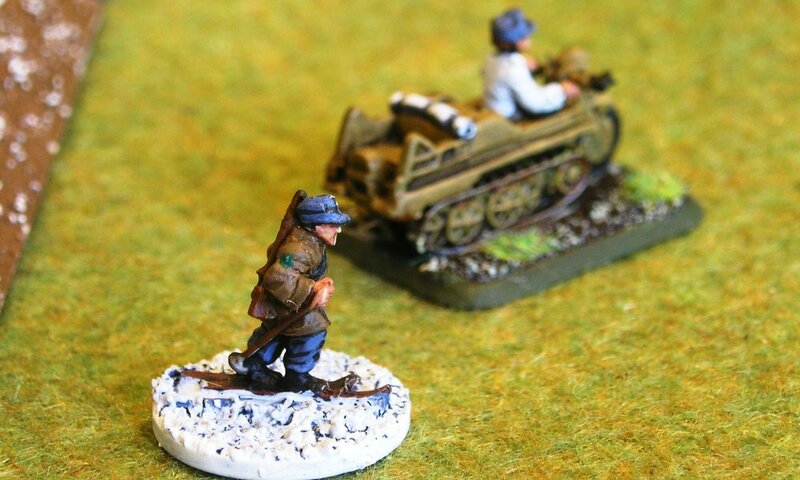 The others quickly took cover (mainly behind wrecked German Panzer Is!) and it looked as if another war of attrition was about to begin. 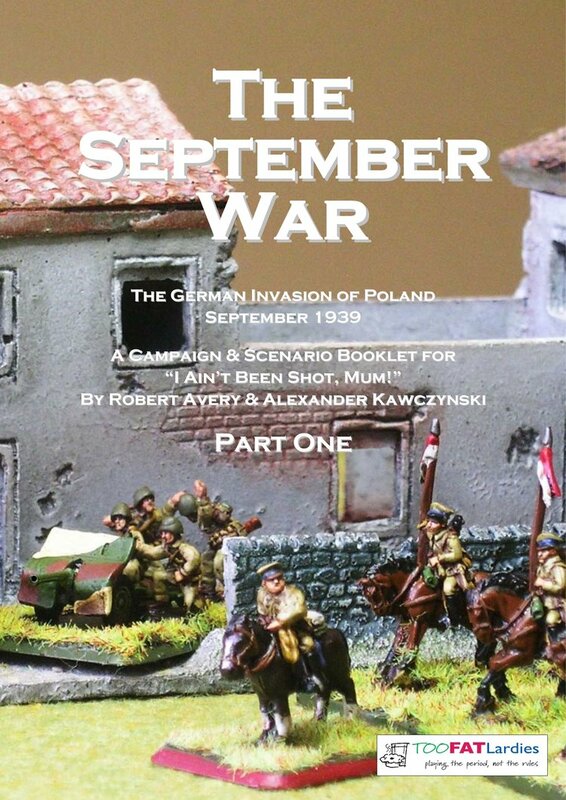 That was it, however, in terms of time, with the final score being 8 points to the Poles and 6 points to the Germans: a Polish victory meaning that more of the "Pomorze" army stationed around Gdynia would get away and be available for our next game, Scenario #8 in the campaign. Quite a different game from our usual head-to-head smash ups! The length of the table really helped to separate the battle into two halves, with part of the Poles' success being down to their ability to transfer assets between their two positions (despite the fact that it was the Germans who had greater numbers and geographically had the internal lines). The main reason for their victory was, I think, really down to a focus on what they needed to do to win the game i.e. earn points, not just kill Germans. They recognised that they could probably only ever get to, and only ever needed to get to, two of the three objectives, and came up with a plan that concentrated their resources on doing just that. Add in a willingness to sacrifice the KOP infantry platoon for the greater good, and the win was their's. The slopes were disappointingly clear of snow! Likewise, it could be argued that the Germans tried to do too much with the forces and positions that they had i.e. they went for all three objectives rather than the two that they actually needed. Add into that a couple of minor tactical errors (light tanks unsupported by infantry charging across open ground towards dug-in anti-tanks guns; using a whole platoon to cover the objective nearest their start point when, considering the situation, a single squad would have done the job just as well) and their fate was sealed. A great game well-played by both sides in good spirit. Right: on to set up Scenario #8!